This patient flew in from Louisiana on a Friday and stayed for one week in San Diego. She had visited with Doc Friedman and Jessica over the phone via video skype and discussed her options of treatment for the desired smile she had been wanted for many years. She planned on getting as much work done on this visit as possible. 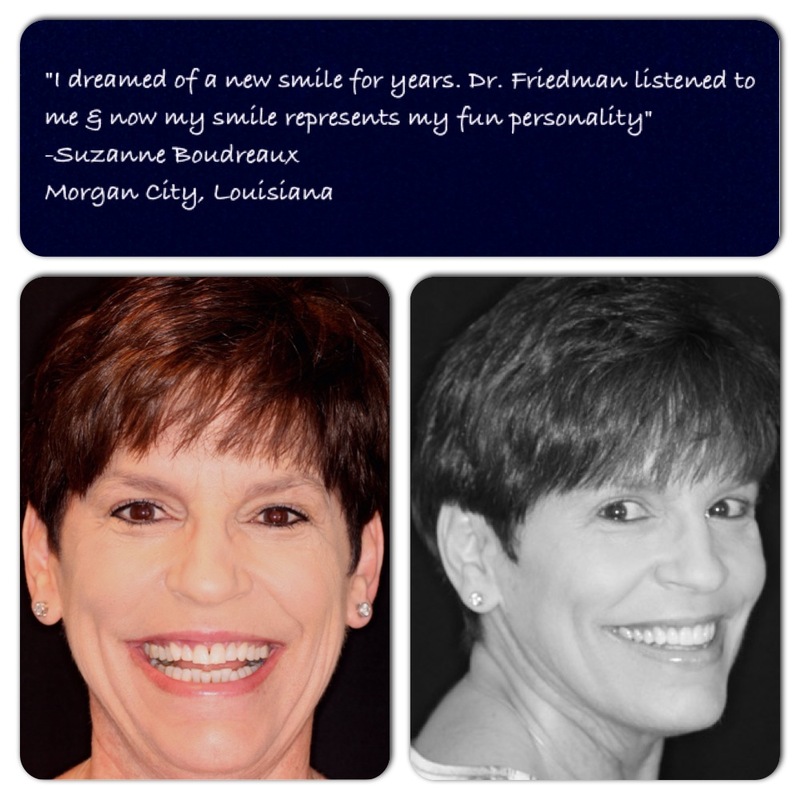 Dr. Friedman saw this patient for her first visit and did all of her pre-treatment procedures. We took several before photos and digitally enhanced them to give her an idea of her desired smile. Dr. Friedman and Jessica gave their options on the shape that would look best with her hair color, skin tone, height, and weight. All of these factors make a difference for the end result. Suzanne was placed in braces on the first visit and on the very next day we sedated the patient with conscious sedation and prepared her upper 8 teeth for her porcelain veneers. The pictures above are her before photo and her after photo with temporary veneers. She will be wearing her temporaries for 6 days while her final porcelain veneers are being generated. Dr. Friedman prefers his patients to wear temporary restorations as this is their “test drive before buying the car”. Any changes the patient would like to make would be made during this period. She will return to the office for one final visit to place the final porcelain veneers on her upper 8 teeth creating a gorgeous smile. With the advancements with orthodontic material and technique, she will only be seen for 3-4 visits to complete the straightening process of her lower teeth.